Three ballistic missiles have been launched Wednesday. Two from submarines in the Barents Sea and Okhotsk Sea and one from Plesetsk. The Press Service of the Ministry of Defense says the first launch took place from the Pacific fleet’s nuclear powered submarine «Svyatoy Georgiy Pobedonosets» reports the military news channel TV Zvezda. Commissioned in 1980, the 36 years old submarine is one of the oldest still in service in the Russian navy. The launch of an intercontinental missile was expected. Since early Wednesday morning, two American surveillance planes have been on patrol near Russian border, one over the Pacific and one over the Barents Sea. TV Zvezda reports that the missile successfully hit its target at Chizha test range. The range is a normal target for ballistic missiles launched from the Pacific area across the Arctic. Located on the Kanin Peninsula in the Arkhangelsk region, the test range is in one of the most remote areas in the European Russian north. On social media, speculations started Tuesday evening about a possible launch of an intercontinental ballistic missile (ICBM) from Plesetsk in Arkhangelsk Region. The airspace near Plesetsk got restrictions and partly closed off for civilian passenger planes èn route to Arkhangelsk. The planes made a curve route west of Plesetsk, according flight routes of civilian planes can be tracked via flightradar24.com. The restrictions around Plesetsk continued Wednesday morning. The speculations came true later on Wednesday. The Ministry of Defence reports that a Topol-M missile was launched from Plesetsk and hit the target on the Kamchatcka Peninsula in the Far East. 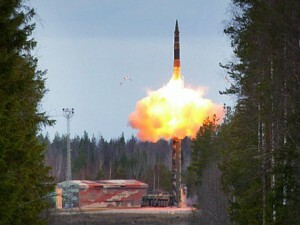 Topol-M is a road-mobile ICBM, one of the most recent ballistic missiles deployed in Russia. Yet another submarine launched ballistic missile (SLBM) was confirmed Wednesday evening. The missile was launched from the Northern fleet’s Delta-IV class submarine “Novomoskovsk” from submerged position in the Barents Sea, the same TV Zvezda reports with referance to Russia’s Ministry of Defence. The Sineva missile also hit the Kura test range in the Far East after a ballistic flight across the Arctic. “Successful firing the ballistic missile from the strategic submarine ”Novomoskovsk” showed a high level of readiness of the Federation’s submarine forces and confirmed the effectiveness of command and control system of the naval strategic nuclear forces,” a press-note from the Ministry of Defence Wedensday evening reads. It has been a busy autumn for Russia’s strategic missile forces. Two week’s ago, the nuclear submarine “Yury Dolgoruky” launched a salvo of two Bulava ballistic missiles from her position submerged in the White Sea. one of the missiles successfully hit the target in the Far East, while the other self-destructed mid-air. Also the strategic bomber part of Russia’s nuclear triad have out flying frequently the last few weeks, including in the north where Tu-160 and Tu-95 flies out in international airspace from the Kola Peninsula and around the Barents-, Norwegian- and North Seas.